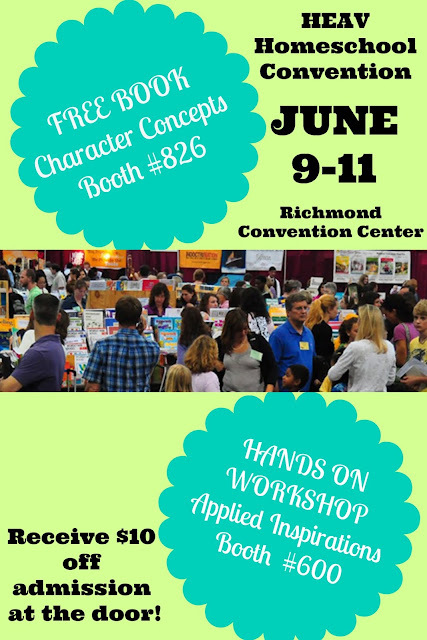 Thrift Schooling: HEAV Convention Is THIS THURSDAY! HEAV Convention Is THIS THURSDAY! It's here! It's finally here. The annual HEAV Homeschool Convention is THIS Thursday, Friday and Saturday. So much to think about and so much to plan for! From past experience, I can tell you that hitting the exhibit hall can be quite overwhelming. So many booths and an overload of information. To help ease the chaos, I like to have specific booths in mind that I plan on visiting when I first arrive and then I will go from there. You can check online and see which exhibitors will be set up in the exhibit hall and where. For starters, if you head over to Booth #826, Character Concepts is handing out a FREE BOOK to anyone who stops by! Have a science kid? Your first stop should be Booth #600 where Applied Inspirations will be holding a hands on soldering workshop! Nervous about SAT and ACT testing? Visit Booth #1228 and meet convention speaker Jean Burk who will be sharing her test taking knowledge and so much more throughout the convention! Check out her videos below. National Merit Scholar-College of her Choice! Up 450 Points and only a Freshman! 600 Points on SAT and 59 Point Raise on PSAT! If you are going, I hope you have a wonderfully refreshing time!